We're long overdue for an adventure on the food train line, and head off to Lakemba for some Bangladeshi. We love the train line that heads from the city through St Peters to Bankstown. Nearly every stop is some kind of food adventure to be had. 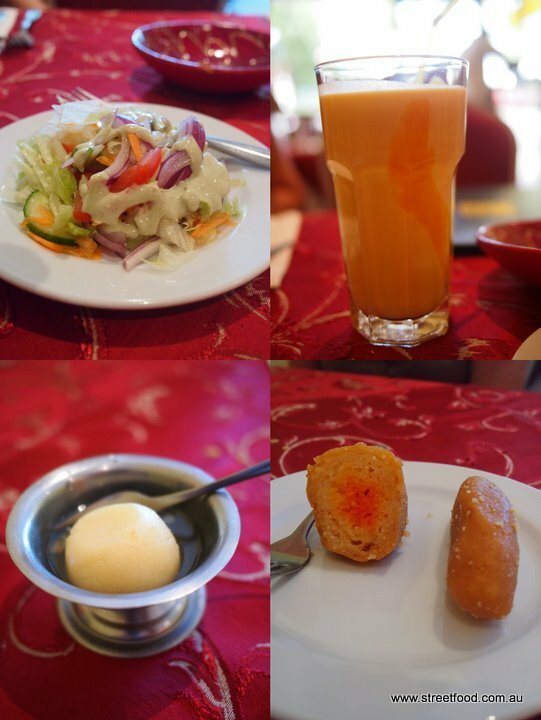 Today we are keen to head to the sister store of Rockdale's Banoful, a Bangladeshi sweets place and restaurant. Not feeling in a strict wet curry mood, we decide to try some of the different choices this place offers. Alison chooses the Bhorta set. The boss lady explains this is a favourite for Bangladeshi people and checks we like a bit of spice. The dish is also known as vorta, and comes in a huge variety of flavours. You choose from different forms of smashed (not wet) vegetables and spicy mixtures that come as little balls of flavoursome joy. We had the bean (with hints of spicy mustard more than chilli), the Chingri (a heady prawn flavour) and the dhal. You also get a wet dhal soup and a big plate of rice for $13.90. This dish really blew our little minds, one of the best things we've eaten in a while. Shawn has been keen to try a Biryani since his last meal at Faheems, and goes for the special Kacci Biryani $13.90. The lamb was pull apart tender and the rice beautifully flavoured, though nothing could match the delights of the Bhorta. A small side salad comes with the biryani, a refreshing bite in between mouthfuls. A mango lassi also helps as a sweet sidekick to the lamb and bhorta. The sweeties are very popular here, they do a steady takeway trade. We try three which are like balls of stodge soaked in sugar syrup, thumbs up. Lakemba is a great place to stroll on a busy weekend afternoon. Aussies from all corners of the planet are out shopping and eating. A relic of it's pre migrant era is the Lakemba Hotel. We stop in for a quick schooner (still only $4!) and soak up the ambiance of groups of old men watching an Iron Woman contest on the TV. The bar looks like it was renovated in the late 60's or 70's, its wood panelling probably replaced the old tiles. The Lakemba hotel in all it's 1970s glory reminds us of pubs we were dragged along to as kids, drinking raspberry and lemonades with plastic giraffe swizzle sticks, eating chicken maryland counter meals and whinging. A copper sign at the front of the hotel calls this the Title Fight Bar, and some research turns up this pub was once owned by Lightweight boxing champion Vic Patrick (read his obituary here). Some of the guys in here look like they've been coming here since old Vic manned the bar. Walking back home via St Peters station turns up a friendly soul eager for a pat. Alison cops a licking all in the name of research. Banoful is across the road from the Lakemba train station exit/entry, it's easy to find at 49 Railway Pde Lakemba. That is one cool hound photo. That mutt has attitude !!! You guys should try Bengali streetfood like Fuchka or Chotputti which can be found at this same place.